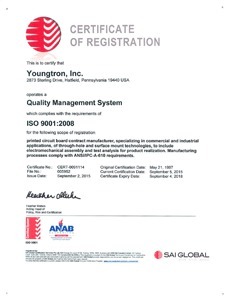 Youngtron, Inc. Certifications - Youngtron, Inc.
Youngtron recognizes the importance of quality products to our customers. Our Quality Assurance Manual and other procedures conform to ANSI/ IPC-A-610 requirements, as well as ANSI/ ISO/ ASQ Q9001. All phases of our operation are documented by our ISO system. This ensures the latest ISO procedures and guidelines are adhered to throughout our organization with emphasis on Customer Focus, Statistical Analysis, and a Quality Policy of “Continual Process Improvement”.